Today DC announced all the Rebirth creative teams, and the biggest splash in social media (well, it was the only one consistently trending on twitter, at least) was Deathstroke, written by Priest and with art by Carlo Pagualayan. I’m sure Priest will have his own post to make about the matter soon enough, but since people are coming here looking for discussion on the book, here’s a place to do it! Among the more unfair things a publisher can do is publish part one of something when they have no idea when parts 2 and so forth will become available. 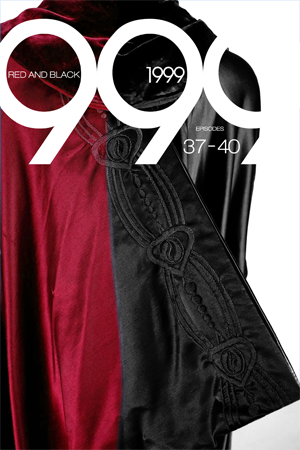 That’s more or less what I’ve selfishly done, post Book One of the 1999 sequel, “1999: Red And Black,” without knowing when I’ll be able to get back to finish the novel. I’d planned this 4-book series for a Spring release, but I’ve become swamped with other things that will likely push Red and Black into the fall. I just wanted to get Book One posted before the March 25th release date of Batman vs. Superman, for reasons which will become obvious if you actually read the book. I’ve not seen any more of the film than most of you have—trailers and clips—and I doubt the film or anything DC may be doing will have much in common with the Red And Black storyline, but I thought I’d do the premature posting just for the record. I’ll keep you posted as to when I’ll be able to finish the novel but, for now, here’s a preview of the 1999 sequel. I’d assumed Amazon would send out alerts as the remaining installments were published (roughly one per month after Book One). Apparently, they did not, as I am only now learning a lot of people who read and enjoyed Book One had no idea the remainder of the series had been published. Amazon has also taken down the series page because I un-published the sampler (“1999 Limited Edition”). I suppose that’s how their automation works, but it’s unfortunate (and a real pain) that I have to go back and forth with customer service to try and get them to stop doing dumb stuff. 1999 has been posted in its entirety and all four installments have been available for months now. I have no immediate plans to consolidate them into a single volume, as I am pursuing avenues to release this book in print, ideally with illustrations (the project was conceived as an illustrated novel). I’ll know more towards the summer, and will post here as things develop. Thank you, everyone who has supported this work. You are currently browsing the Welcome To Lamercie Park blog archives for March, 2016.